…always a Hawkeye! The UI Alumni Association makes it easy for Iowa graduates to connect with the university as well as with other alumni in their area. To learn more about the membership-based association and its benefits, visit www.iowalum.com. When you walk into Vince Nelson’s office at the Levitt Center for University Advancement, don’t let the stuffed bulldogs and other Drake University paraphernalia fool you. He is indeed the CEO of the University of Iowa Alumni Association. And though he has two degrees from Drake and none from Iowa, he is all Hawkeye—and there is plenty of black and gold in his workspace to prove it. Nelson scratched plans to go to veterinary school when he learned he could attend Drake on a music scholarship. There he played French horn and also studied voice and piano. He stayed to pursue a master’s degree and was in line to succeed the school’s band director, but then a twist of fate intervened. Drake asked him to work part-time in admissions, running a program that enlisted alumni to help recruit students. 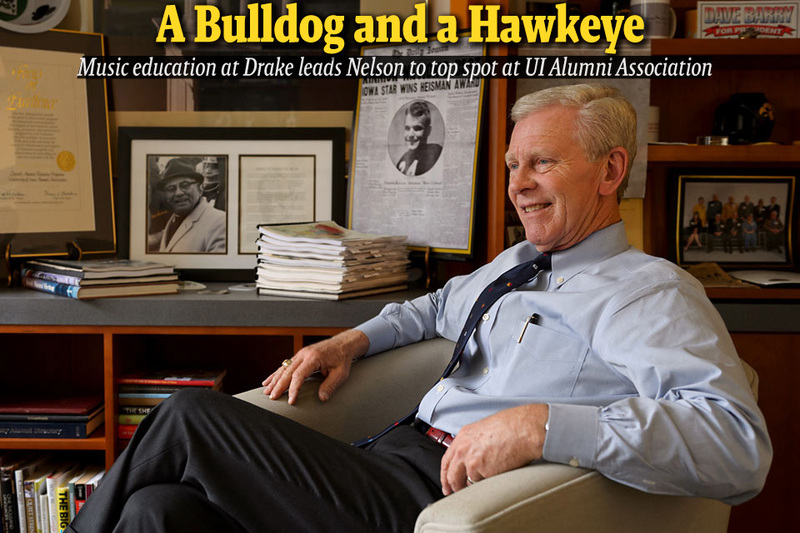 Nelson was hired at Iowa in 1988, taking the helm of the UI Alumni Association in 1997. Today he oversees a $3.6 million annual budget, as well as the many programs and services the association offers to more than 50,000 members. Nelson recently spoke with Spectator about his work. First of all, what is the alumni association? The Alumni Association is an organization that allows our graduates to connect back to the institution and to formalize their relationship with it. It’s been on campus in one form or another for about 145 years, and we’ve been membership-based since 1948. We offer regular communications, such as the Iowa Alumni Magazine, and organize a variety of events and other programming. Anyone is welcome to join. The organization was formed, very simply, as Alumni Records, when the university decided, “We should keep track of our graduates, and then we should communicate with them.” A newsletter developed. Next came reunions—getting the classes together on campus to renew experiences and to reunite. The next thing was to pass the hat—so, private giving and development work. That’s how things started. But the real reason alumni associations started to flourish was the by the interest of alumni to connect back to the institution. It was a way to formalize that connection. Sometimes people confuse us with the UI Foundation, or they think we get all of our support from the university. But we’re like a small business—we’ve got to make payroll each Friday. Of our $3.6 million operating budget, we have to generate about $3.2 million on our own. Each day is different. Usually I’m at work by seven in the morning—that’s the farm boy in me. That’s by choice. I like that time between seven and eight. It’s quiet, and I read through the papers and go through email. We have an understanding in the office that if you get an email, you attempt to respond to that email within 24 hours. If you receive a phone call, it is encouraged that you try to respond the day you receive it. I have several standing meetings throughout the week. We have 14 executive staff, another eight administrative support staff, and a number of students working for us in different areas—some are regular part-time employees, some are work-study, others are interns. We’re blessed with a very good, creative staff, but we’re also blessed with a staff that has been here a long time and therefore possesses a wealth of institutional knowledge. The biggest challenge for us—and for my Big Ten colleagues—is making sure we have the ability to provide the financial resources and also the human resources to do what we need to do. And, two, to make sure we’re prioritizing and putting them where they can best assist the organization. You’ve been at Iowa for nearly 25 years. What has changed in the alumni world since then? Engaging new membership is tougher. I think 20 years ago, alumni thought, “Yeah, I should join.” Today’s graduate is looking for value, as well they should—they’re coming out of college with greater amounts of debt. We need to show how and why it’s important for them stay engaged. With so many people competing for their dollar, they have to make choices just like all of us do. Another area that has changed is career connections and networking. We have IOWA Clubs across the country, and they continue to grow. They offer UI graduates a personal connection with other alumni in their area through a variety of events, many of them social in nature. Technology and communication also have changed pretty dramatically, and the advent of social media allows alumni to easily stay engaged. Even 15 years ago, email was just starting to come in, and now it’s passé. Technology is only going to continue to enhance our opportunities to connect with alumni. What are your goals with the association? We need to make sure we are always reminding people on campus of the importance of our alumni as a resource, and I think our UI colleges are doing a really good job of that now. Our graduates do amazing things, and we can be so proud of what they accomplish and how they distinguish not only themselves but also this institution. At our events, whether we’re out on the road with President Mason or putting on other programming, I always end my remarks with, “Remember this—once a Hawkeye,” and without even thinking people jump right in with “Always a Hawkeye!” It’s automatic. I’ve been blessed in my life to have the opportunity to do the things that I’ve been able to do. It’s just a lot of fun.